Raise your hand if you’re feeling dessert for breakfast. Both my hands are so highly raised. I mean, twist me arm why don’t you. OKAY. I guess I’ll eat brown butter and caramely apples for breakfast if you WANT me to. Gosh. This isn’t ACTUAL dessert because it has oatmeal. And apples. Which means that this entire meal could possibly lower your cholesterol and keep the doctor away. Right right right? Guys. I am in full blown FALL mode. I got back from upstate New York last night (definitely want to move there, no big deal) and it was so beautiful and stunning and full of autumn cheer. And when I returned home the air was crisp and Eddie had bought ten (yes TEN) pumpkins for our patio. Now that we have Max let’s just say it’s kind of easy to go overboard on the holiday décor. I want to submerge myself in a vat of apple cider and eat a million apple cider donuts and burn fall scents like the crazy candle lady that I am. I definitely broke out a way-too-heavy scarf and can’t stop looking at sweaters in colors of burgundy and mustard. I even want to maybe eat OATMEAL. What did I do with the real me? It’s true that I tend to like my oatmeal best in cookie form, but sometimes a bowl of steel cut oats with brown sugar and cream tastes so freaking wonderful in cooler weather. I like it best when it’s baked but since I tend to lean towards the highly impatient millennial side, stovetop is easiest. 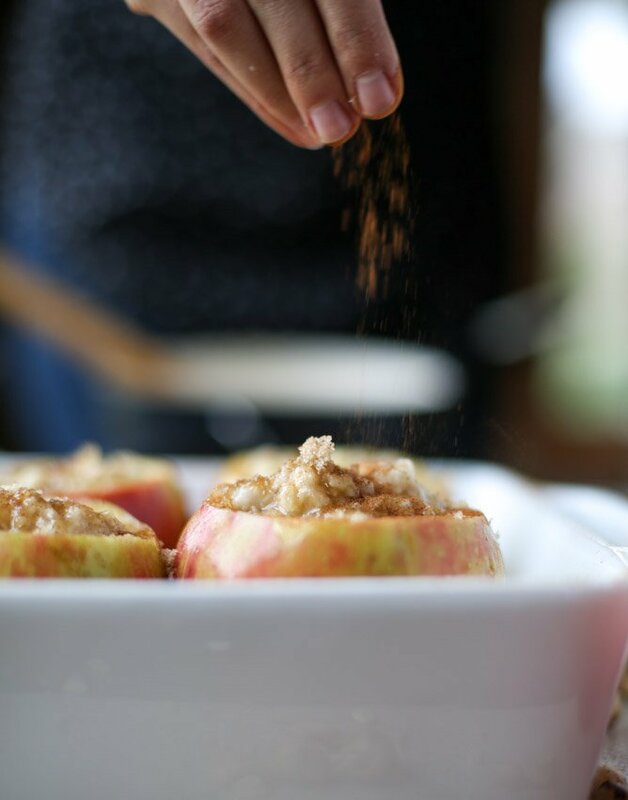 I’ve made baked apples before but they weren’t stuffed with actual brown sugar oatmeal. 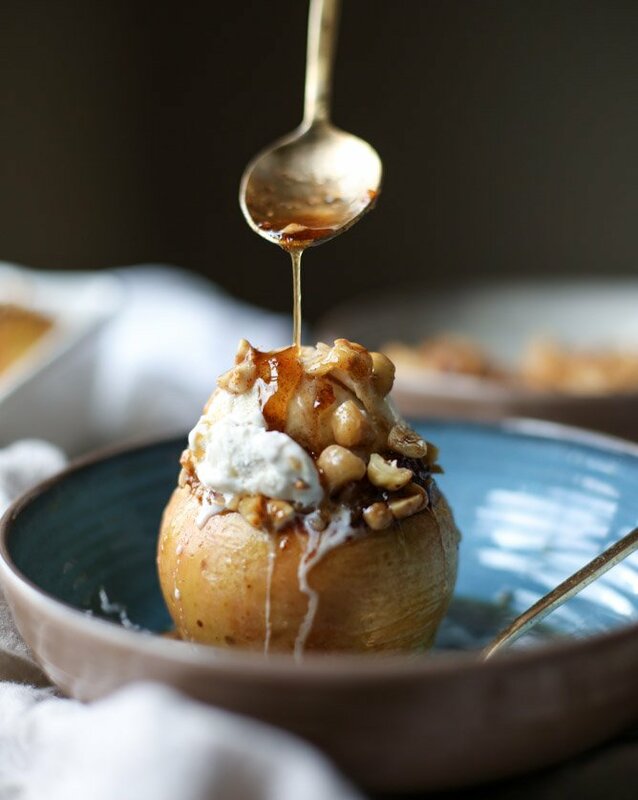 The filling for those was more of a crumbly crisp like filling – crunchy and super sweet and full of bourbon. These ones can totally pass for breakfast… because I say so? 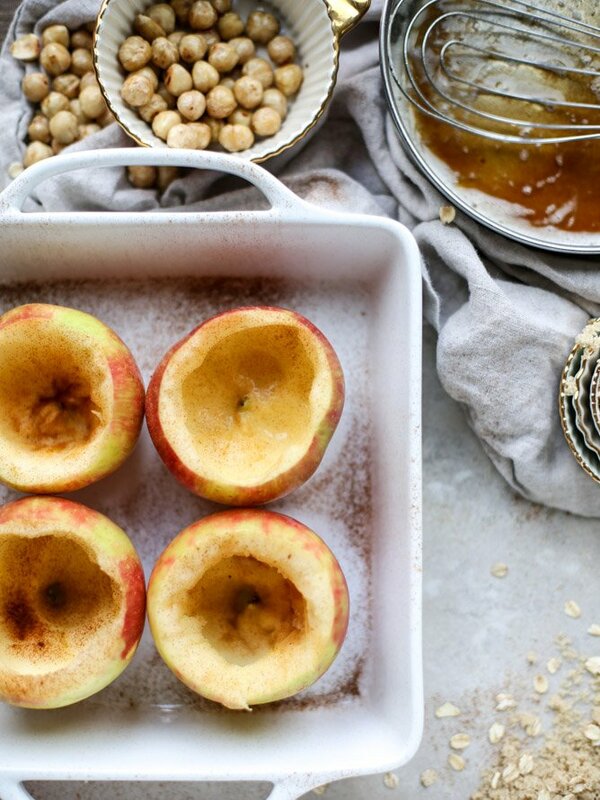 The apples are sprinkled with cinnamon and drizzled with brown butter before being stuffed with the creamy oats. Like oatmeal you could already eat. 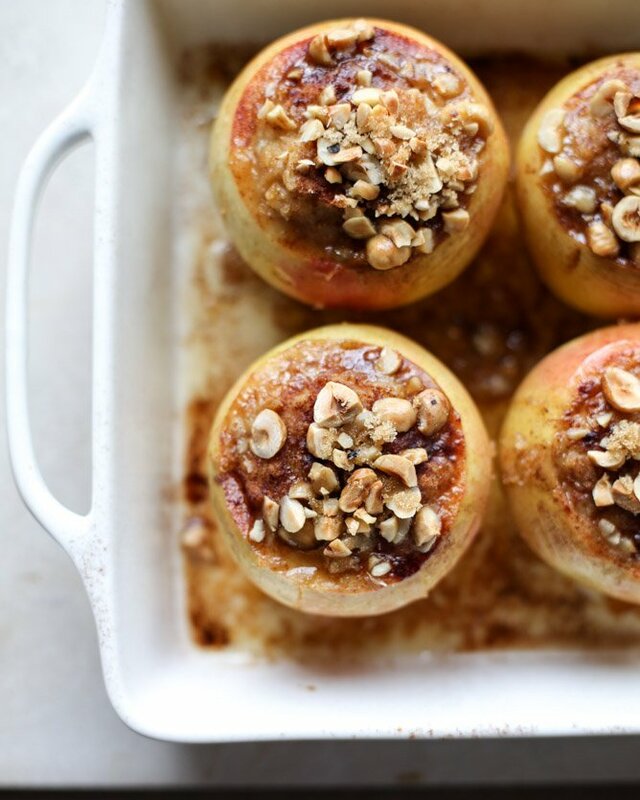 THEN they are topped with chopped hazelnuts and baked until perfection. When they come out, a bit fat drizzle of maple brown butter goes on top. I never even cared about maple syrup – until this week apparently since this is my THIRD recipe in a row that involves it. Aren’t these just super adorable? They are perfect for sharing or even for brunch and you can make them a few hours ahead of time too. Maybe even prep them the night before. Plus, ice cream is still cool for breakfast too. I said so! Take each apple and cut the stem and center out to create a hole in the middle. You want to be able to stuff the oatmeal in the center and you also want to use the apple insides for the oatmeal! Chop up the apple that you remove from center. Sprinkle the apple insides with the cinnamon. Bring the water to boil. 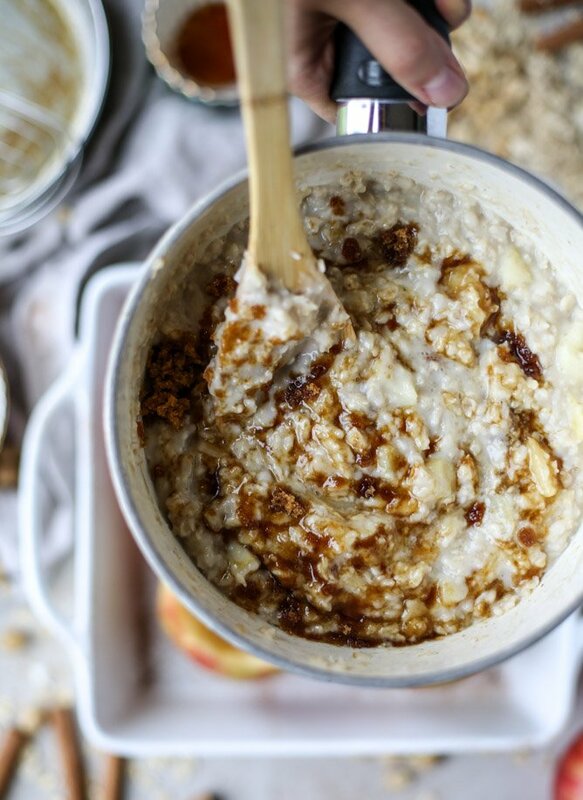 Add the oats, apple pieces and the salt and reduce the heat to a simmer. Cook, stirring often, until the oats are thick and creamy, about 10 to 15 minutes. Stir in the heavy cream and brown sugar. 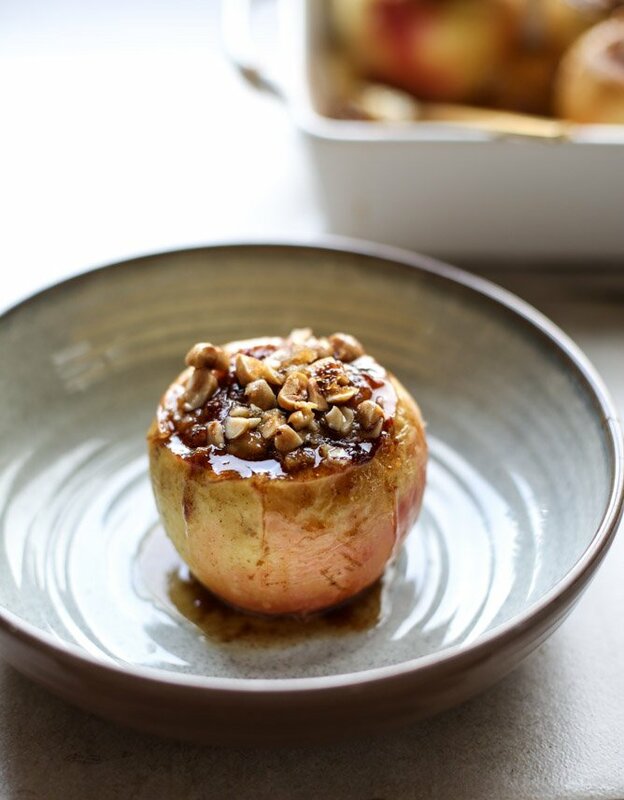 While the oatmeal is cooking, heat the hazelnuts in a skillet over medium-low heat, shaking or stirring constantly. Cook until they are toasted and fragrant, about 6 to 8 minutes. Remove, let cool and then coarsely chop. 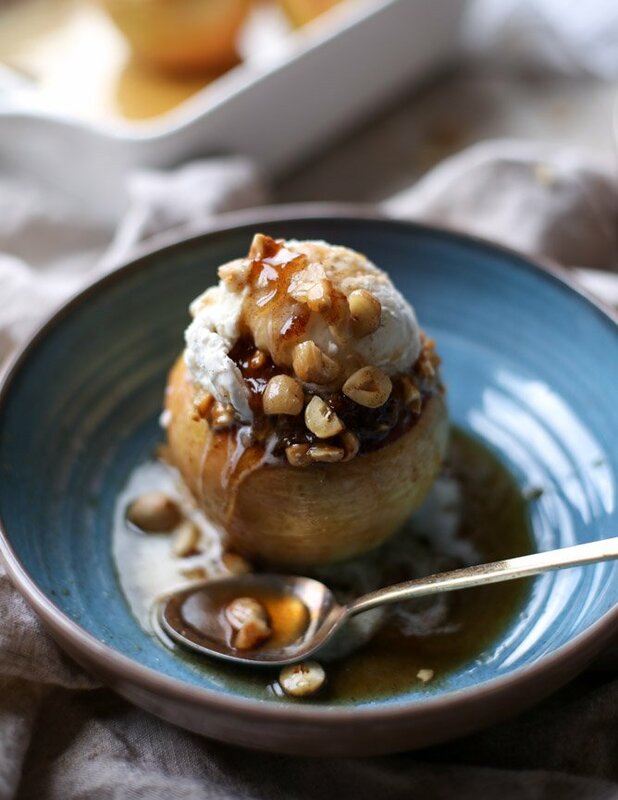 Drizzle each apple inside with some the maple brown butter (but save some for the topping too!). 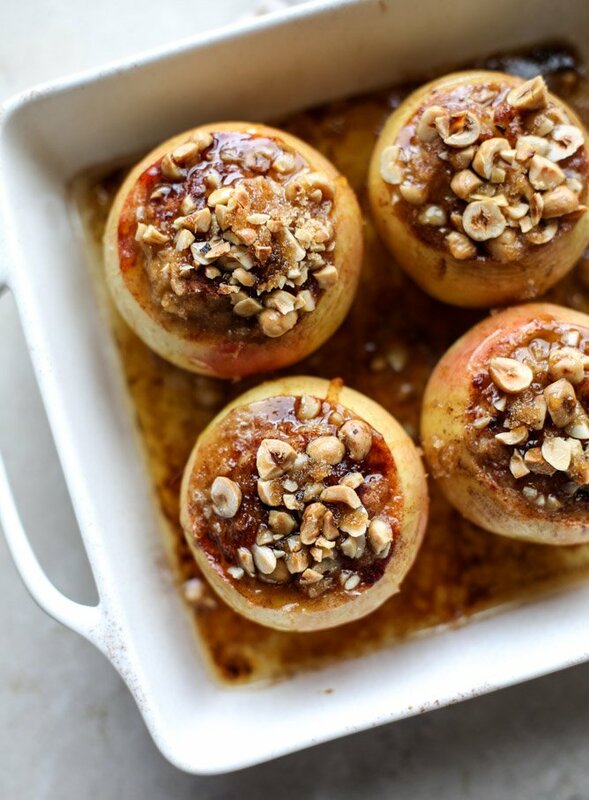 Fill each apple with the oatmeal and top with the hazelnuts. Bake for 35 to 40 minutes, until the apples are softened. 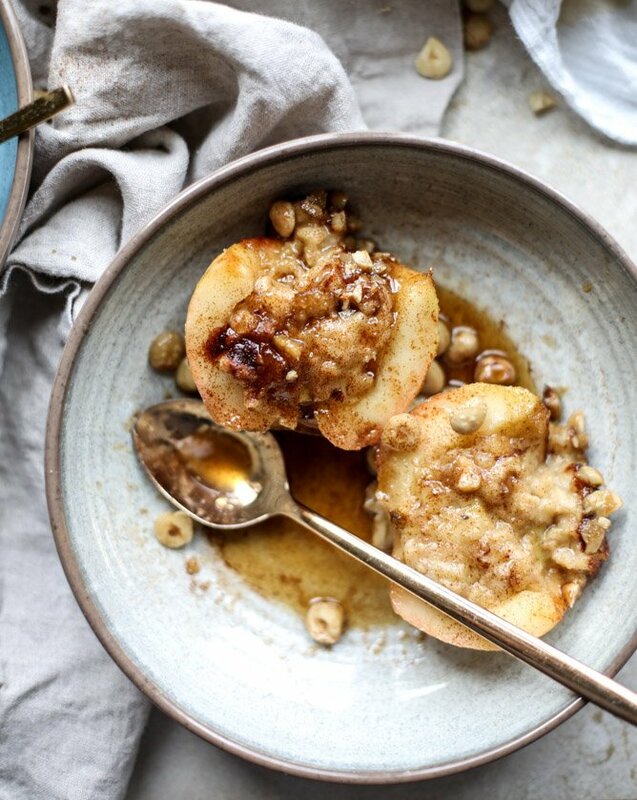 Serve immediately with the remaining maple brown butter. And you can always add ice cream on top if desired! Heat the butter over medium heat in a saucepan, whisking constantly. Cook until it bubbles and the brown bits appear on the bottom (about 4 to 5 minutes) then quickly stir in the maple syrup and remove it from the heat. Whisk for another 30 seconds. Use immediately. I’m moving my life into that bowl. Both of my hands are raised super high and I’m jumping up and down. Ice cream is an absolutely mandatory topping as well. 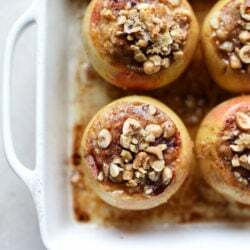 I love a good dessert for breakfast, and I’ve never thought about having a baked apple in the morning. My mum loves making them with big cooking apples in the Autumn for dessert. Sometimes they explode in the oven, so as a family we call them splurged apples! i love the sound of this rachel!! Totally breakfast! I just had a bowl of oats and now am eating any apple…so this just cuts out the work of washing an extra bowl :P Bahaha! 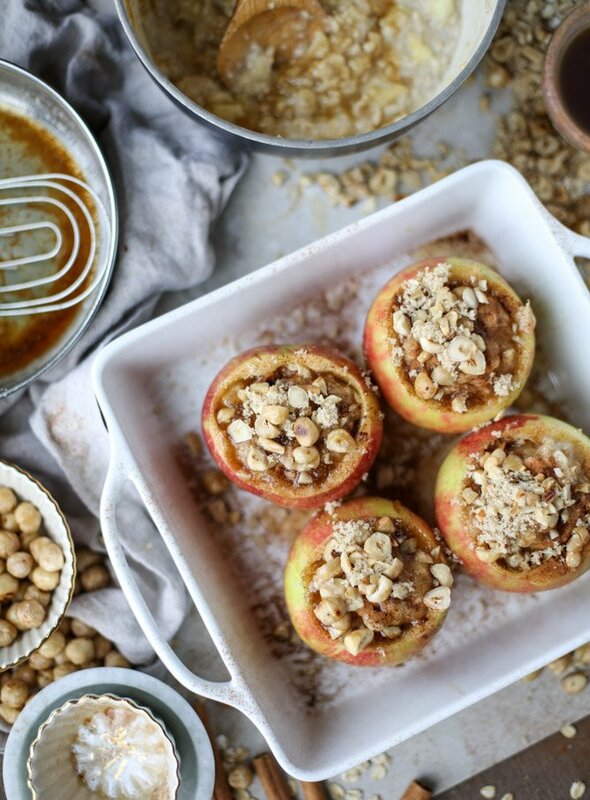 These apples look divinely delicious.Thanks for sharing the recipe. You mentioned apple cider donuts…any chance you might come up with a baked version and or an apple cider quick bread recipe? I would be solo grateful! i definitely need to come up with an awesome apple cider donut recipe! i just had one of the best i’ve ever tasted last week. Seriously? Fall perfection right here! I am in love! Wish I had seen these before I made mine. Anyway can make this again as who is going to stop me? Looks Amazing. Perfect combo Apples and Oats daily keep the dietitian away. Your recipes always look amazing. I’m not one to ever leave a comment on a webpage, but I felt compelled to tell you that I just made these, and they are quite literally the most delicious thing to ever come out of my kitchen. Thank you for this wonderful recipe! i am so thrilled you are enjoying them! thank you so much for commenting liz! 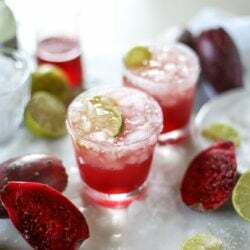 hey girl these looks so tasty! What an awesome breakfast treat! Give me some more maple brown butter! That must be your unique thing. Wow, I am going to make this T-O-D-A-Y no doubt, but I would like to make a twist and put some of my thoughts into it, Maybe some carmelized bananas? :) who knows, Ill try and if it comes out good ill credit you for inspiration :D.
I am 100% about dessert for breakfast and these have me drooling. I Wish Your recipes had a link to Pinterest like they used to. The only option I see now is to print them. Am I missing something? Hi Lisa! can you tell me what you mean by a “link to pinterest”? We still have a pin button over the images if you hold you mouse over them. Was there something else on the site that let you pin? There might have been, I just can’t figure out what it was. As soon as I know I can add it back in if it’s something that was missing! Thank you for your response. I’m using an iPad, so I don’t have a mouse to hover over the images and I don’t see any way to pin your recipes now 😟. how did you pin them before? Was there a pin button somewhere? Yes, there used to be a Pin button for each of your recipes. I don’t see one anymore. I just made these and they’re delicious. I added vanilla to the oats as well as some unsweetened coconut. Simply divine! There was extra oats, so I put them in small jars that I use to make overnight oatmeal and my daughter will have oatmeal and apples for breakfast this week. I made this and oh. my. gosh. it was amazing. You come across as SUCH a nice person on video! It was my first time watching you on video and I’m blown away. It’s like who wouldn’t want to be friends with you (and hang out in your kitchen?!). I mean I already love your dedication to creating content everyday (and posting tons of recipes) but the videos just took it over the top for me. You go girl!